At this point Razer's industrial design is fairly well understood. One of the things about most Windows laptops that bothers me is that even expensive models use a fair amount of plastic in their construction. 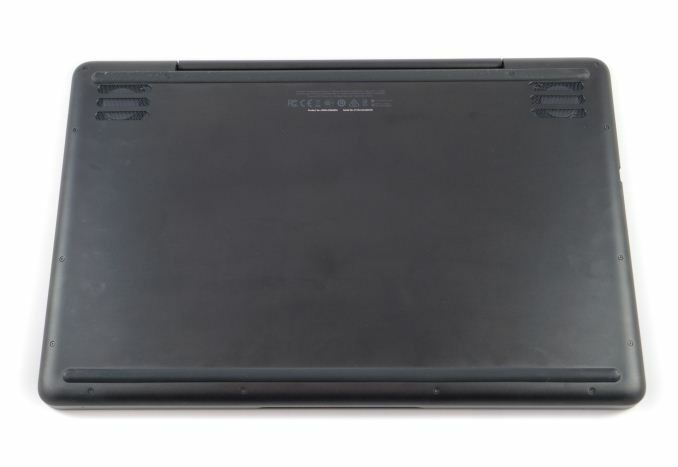 For example, I often see Dell's XPS laptops mentioned as good high end options for users that are disillusioned with Apple's MacBook Pros, but the bulk of the chassis is carbon fiber reinforced polymer, which is still plastic no matter how you put it. Razer's laptops are definitely not cheap, but the quality of the aluminum chassis on their laptops is arguably second to none among Windows computer manufacturers. The only other devices I can think of that come close are Microsoft's own Surface products which are made of magnesium. The Blade Pro is essentially a larger version of the standard 14" Razer Blade. The matte black finish is striking, and you'll seldom see another device made from aluminum with such a dark color. The only issue is that every single fingerprint and spec of dust is visible, and eventually I just gave up on trying to keep the chassis free of smudges because it's a never-ending battle. 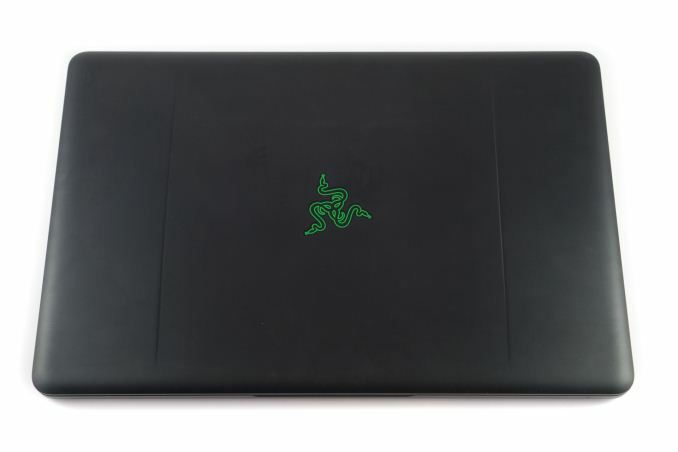 From the top you can see Razer logo, and Razer continues to have the center section of the top cover slightly lower than the sides, which creates two distinct lines when light shines on it. The right side of the Blade Pro has an HDMI 2.0 port, a standard USB 3 Type-A port. a Thunderbolt 3 port, and an SD card reader. The left side has two additional Type-A ports, a 3.5mm audio port, the increasingly endangered ethernet port, and the connector for the power supply. The assortment of ports should be enough for any user, although in a perfect world I'd ask for another Thunderbolt 3 or USB Type-C port. Aesthetically, the ethernet port looks a bit weird because it's actually larger than the sides of the laptop, and the Thunderbolt port would look better if it was center-aligned like it is on the Blade Stealth. Razer continues to put their intake fans on the bottom of the laptop. To make this work, there's also two rubber strips that act as feet to elevate the laptop slightly and prevent it from scraping against the surface it's placed on. From an aesthetic perspective, it would probably be better to hide the screws underneath the rubber feet, like Google does with the Chromebook Pixel. On the other hand, exposing the screws does allow access to the laptop's internals, although the Blade Pro isn't a laptop with as many removable and upgradeable components as a DTR, so you'd likely be accessing it to keep dust from building up inside. The Blade Pro has a unique layout for the trackpad and keyboard. Most laptops have both the trackpad and keyboard centered, with the trackpad below the keyboard. 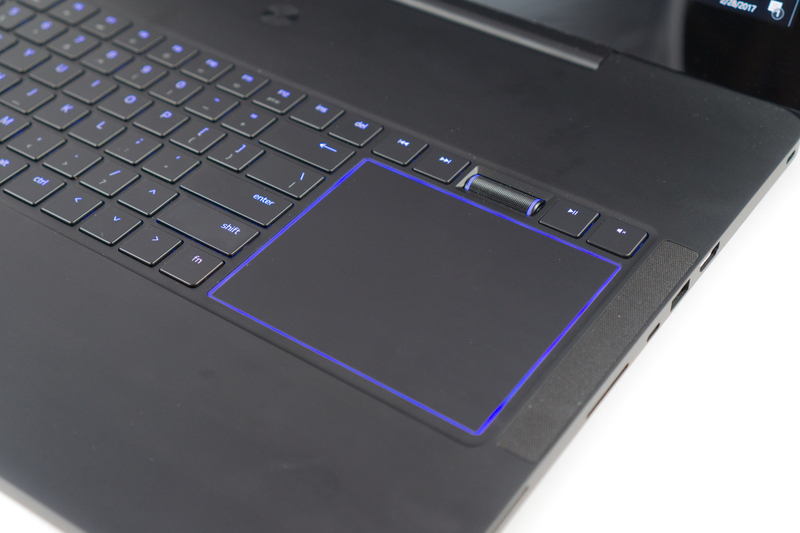 The Blade Pro takes advantage of its large width by placing the trackpad to the right of the keyboard. Whether you'll like or dislike this is a matter of opinion. On one hand, the layout has some interesting ergonomics, but on the other hand you lose the possibility of having a full keyboard layout which could be troublesome for gamers that tie macros to their keyboard's numpad. The previous Blade Pro had what was called the Switchblade, which was basically a capacitive touchscreen that functioned as a trackpad and as a way to display custom function buttons and other controls. It's not clear to me exactly why, but the new Blade Pro has gone back to a typical trackpad. This again poses an issue for games that rely on macros, as you don't have a numpad and the ten custom keys from the Switchblade are now unavailable as well. Razer's trackpad is quite good as far as Windows laptops go. It has a smooth glass surface, and quite a satisfying click, although some users may find that the force required to register a click is too high. I find that the cursor acceleration curves in Windows are still not as good as macOS for trackpad use, and gestures aren't as responsive either. I've also had some troubles with the cursor moving slightly when I click. After so many years of trying out various Windows laptops I've basically accepted that this is just how things are always going to be, and the Blade Pro is truthfully one of the best I've ever used, but I still find myself hoping for more. As for the keyboard, it uses Razer's custom-designed mechanical laptop switches. I've had experience with these in the past on Razer's iPad Pro typing case, and while I'm not going to act like my opinion on them is some absolute truth, I do have to say that I'm not a fan of the keyboard. Aesthetically, I find that the very angular fonts used on gaming keyboards are unsightly. As for the layout of the keyboard, I find it quite annoying that the unique trackpad position means that such a large laptop still has to compromise the position of keys. In particular, I think putting the right shift key to the right of the top arrow key is a terrible layout decision, and I've completely lost track of how many times I've hit the up arrow when I mean to hit shift. The low-profile mechanical switches are the selling point here. I'm a big fan of mechanical desktop keyboards, and I lean toward either Cherry Blue and Cherry Brown switches depending on how often people in the surrounding area yell at me about the noise. My honest opinion about the Blade Pro is that the keys don't feel like mechanical switches, and I would argue that they're worse than the best scissor keyboards I've used. I find that the actuation force is too high for my liking, and it always feels like the keyboard is fighting back against me when I'm trying to type or play a game. I think the intent was to try and mimic a standard mechanical switch despite the reduced travel distance on a laptop keyboard, but it just doesn't work for me. The keys are also much more wobbly than I expected considering the design of the switch and the size of each key cap. Again, these are just my own impressions, and I actually hope that most people disagree with them because having trouble with the keyboard on a laptop is obviously a problem. It's just that I've honestly used scissor-switch based keyboards with larger key caps that are more stable and are easier to press, and I think that would have been a better option than these mechanical keys.